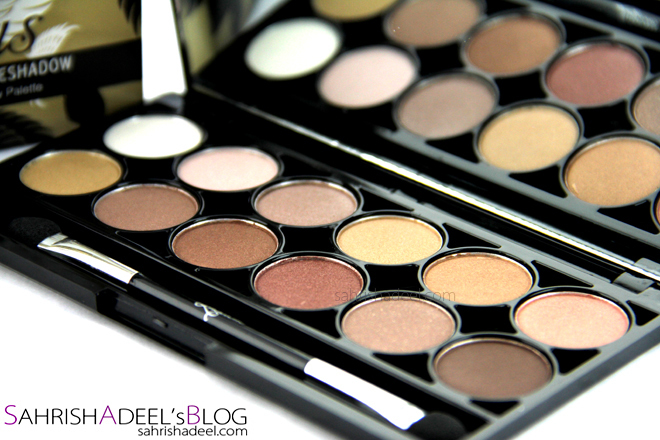 I love Eyeshadow Palette in Divine Naturals by Luscious Cosmetics - Review & Swatches | Sahrish Adeel - Malaysia based Pakistani Beauty & Lifestyle Blogger! When I first came to know about Luscious Cosmetics launching eye shadow palettes, I was way too excited. And when they came out, I became more excited to try them. The first and most that I wanted to try was this Divine Naturals mostly because neutrals shades are the ones that anyone of any age at any occasion can wear. Let's see if Luscious's new palette is upto the hype or not. This palette comes in a card board box especially designed for Divine Naturals and to make the palette more secure, it comes with a lining of a foamy material around the palette. The palette itself is made up of a very good quality plastic and comes with 12 eye shadows, one dual ended applicator and one mirror. It contains a total of 15.6 grams of product. These swatches have been taken over Professional Eye Primer by MUA which for me is a must have on everyday basis as I have oily eyelids. I prefer my eye shadow palettes to have a transparent lid so I can see the shadows without opening the palette but I cannot tell you how much I loved this one. I am currently on a very sudden and short trip in Pakistan and the mirror has helped me a lot during travelling. I absolutely loved the shiny and sturdy packaging and the applicator also works good in picking and packing up the shadows. I only wish that if they had to make this shiny packaging, it would have been scratch proof or they should have made it a bit less shiny so the scratches wouldn't be too obvious. Nicely Pigmented: Shades 1, 2, 5, 7 and 10 are nicely pigmented and anyone who does not have a creasing issue due to oily lids can wear them without a primer or a base. Oh and shade 1 makes such a nice highlighter for the face as well. They are build-able but I would still suggest using a base or primer for perfect and log lasting result. OK-ly Pigmented: Shades 3, 9 and 12 are not badly pigmented but they should have been better. They are not too pigmented without a primer but works well over a primer. 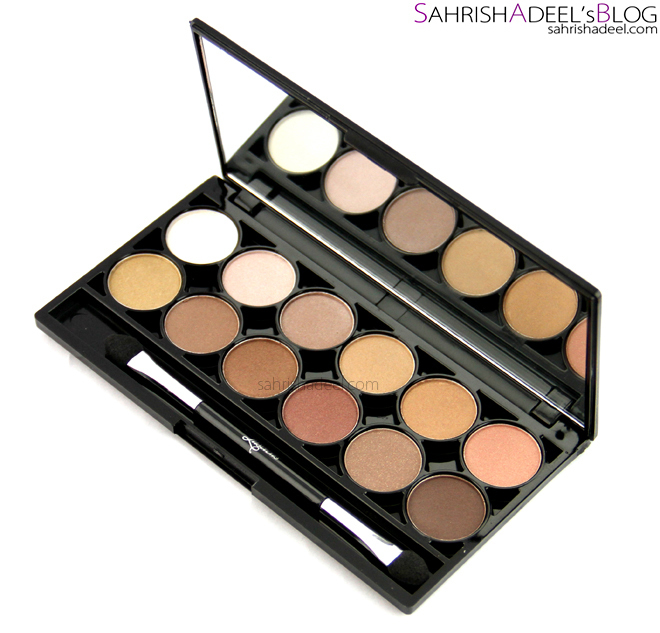 I love shade 12 for my crease and sometimes for face contour as this is the only matte shade in this palette. Y U NO Pigmented: Shades 4, 6, 8 and 11 are the ones that made me a bit disappointed. They are not worst (trust me, I have seen worst ones too) but you really have to layer and layer and layer to get some result or wear them wet which is not my personal favorite method. Since they are not nicely pigmented but have a slightly shiny tone, they look good for highlighting purpose. Shades that I have used the most are 1, 2, and 12. My signature look for this trip was my Birthday Makeup Look for this year and I was able to achieve same results with these shadows. About the finish, all of these eye shadows are somewhat shimmery except for shade 12 which is a true matte shade. The shimmer is obvious in some and not-too-obvious in others. Still they are all wearable on everyday bases and you won't look like a disco ball. See the swatches for the reference once again. Staying power is more than 6 hours in this weather but only over a primer. I don't like to judge eye shadows without a primer underneath because of my oily lids. But I have tried these once without a primer and they stayed for about 3-4 hours at the areas like brow bone and inner corner of the eyes (where my eyes are not really oily). So I can say that they have a nice staying power without a primer too if you don't have oily lids but they will tone down during a hot weather and do not expect a good pigmentation as well. In short, a primer/base is highly recommended. Overall, I really liked this palette and I see myself using this for a long time. This is a great addition in Luscious Cosmetics' range. However, the formula for some shadows still needs improvement in terms of pigmentation and some more matte shades as well. Some shades are nicely pigmented. 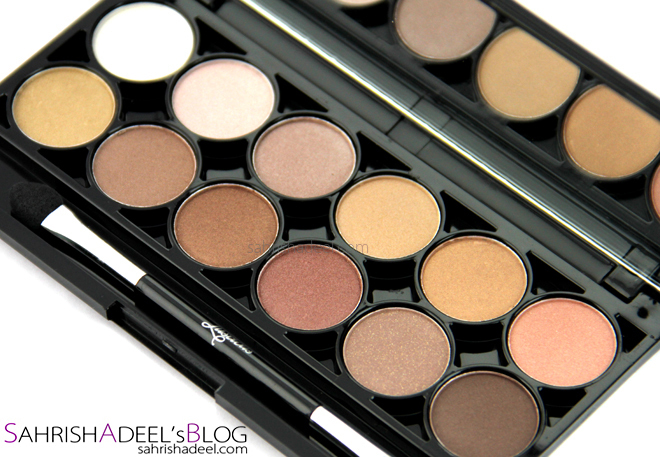 Nice palette for neutral eye makeup. Staying power is pretty good over an eye primer. Some shadows are not really pigmented. There should have been some more matte shades. 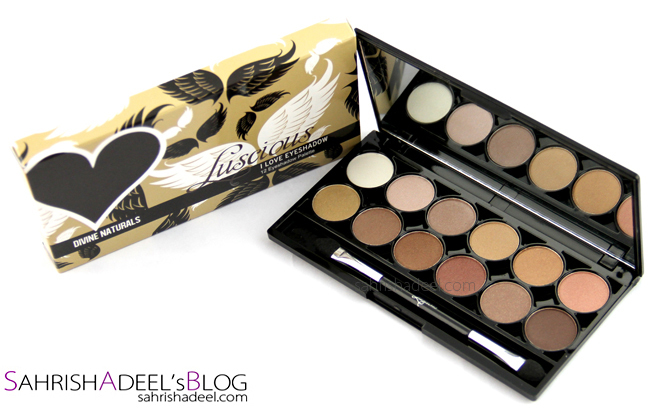 This palette is retailed at PKR 1150 and is available online at Luscious Cosmetics' website. You can also find Luscious Cosmetics' products all across Pakistan. Have you tried any of these new palettes by Luscious Cosmetics yet? More reviews on eye shadow palettes. More reviews on Luscious Cosmetics' products.